Okay, so Crystal Castles may have received a six on the douchebag scale, but there's no denying that they put on a crazy live show. Those infamously wild live performances may have finally taken their toll on lead singer Alice Glass, though, as she was hospitalized this week in Tokyo. Speaking with TheVine, producer/instrumentalist Ethan Kath said, "Alice is injured... We're at the hospital, having X-rays taken. It appears that she has a broken ankle." This is apparently an aggravation of a previous injury, as he said, "It happened earlier." However, this setback won't interfere with the band's tour plans. Their publicist told TheVine that their current Australian outing is still on, while Kath speculated, "Maybe she'll be doing it in a wheelchair. I'm not sure." Sure enough, they performed today (January 21) in New Zealand, and Stuff.co.nz reports that Glass performed a short set on crutches. 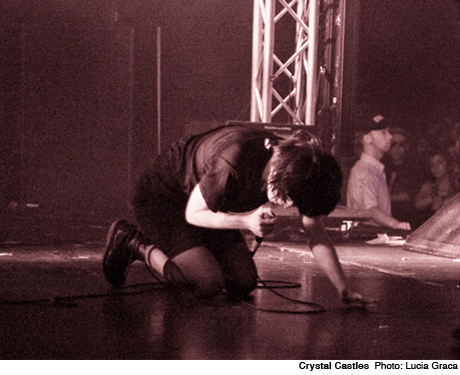 In March, Crystal Castles will be retuning to North America for a tour that includes dates in Toronto and Vancouver. See the dates here.